X-Men Monday (featuring Jordan D. White) #8 – Major X, favorite mutants and working with Jonathan Hickman – AiPT! Plus, your eXclusive first look at the cover of X-Force #10! Welcome, X-Fans, to another uncanny edition of X-Men Monday at AiPT! Well, a lot’s happened since we last got together. I’m, of course, talking about the reveal of those dynamic covers to the first issues of House of X and Powers of X! X-Fans have questions. Fortunately, X-Men Senior Editor Jordan D. White’s here to shed some light on writer Jonathan Hickman’s plans for Marvel’s mutants… and a bunch of other stuff, per usual, including your eXclusive first look at the cover of X-Force #10! AiPT! : So far, Major X has proven to be quite the success! Adam Reck‏ (@arthurstacy) said that we’ve now seen two declarations that Major X has “sold out” before it even hit shelves. But what does that actually mean? Hasn’t every issue “sold out” based on whatever number of issues the direct market ordered? Jordan: The print run of a comic is set just after the final order cutoff, which is… I think about 3 weeks before the book comes out? I am out of the office sick, so I cannot check the exact dates, but I think that’s about right. When the print run is set, that’s how many copies are printed. If stores reorder or up their orders after that, there’s usually a little overprint stock we make just in case of problems or whatnot… but if enough people up their orders then we can sell out of the first printing. And that can happen before a book goes on sale if there is a buzz about it ahead of time and stores don’t think they ordered enough for their customers initially. So, we offer up a second printing. It means the stores want more than they originally thought they wanted. AiPT! : Now, minzyprime‏ (@minzyprime1010) wanted to know why Jean Grey didn’t try to get Rachel back after she was taken as a hound? Minzyprime understands why Scott wasn’t trying to get her back, but Jean knew she had reverted back to a hound and disappeared at the end of Extermination. Jordan: Why would you think she didn’t try? I am sure they were on the lookout for any signs of where Ahab went off to. But before they found him, X-Man started causing trouble, and that needed to be dealt with. AiPT! : Brett‏ (@mutantmanchild) was wondering if there was any chance of Neal Shaara making a return. We know he answered Jean’s call for help in Uncanny X-Men, so he’s still out there. Brett added that the X-books need more male people of color! Jordan: Anything is possible! As you said, he’s still around. AiPT! : Tim Maytom‏ (@trivia_lad) had a very important question – Do the X-Men all share one HBO Go account, and if so, who’s name is on the bill? Jordan: I think in Age of X-Man, HBO never got as big as it did here, since there was no market for the naughty hijinx of Dream On or the incredibly dark subversive Oz. In Uncanny, I bet they are mooching off Harry’s subscription to watch Game of Thrones this weekend. AiPT! : Tatoun‏ (@KyleBarrech) wanted to know why Sage isn’t cited when talking about the original X-Men. Even if she was hidden by Xavier to be a mole in the Hellfire Club, she’s still one of the original recruits. They were six, not five, and it would be cool to have editorial and writers at least acknowledge that. Jordan: I think you’ve answered your own question–because it was hidden. The X-Men don’t think of her as a founding member. Maybe Xavier did, but the O5 didn’t consider her one of them. She had a very different mission and experience than they did. Even if you want to say she was recruited by Xavier first, she wasn’t a part of THAT team, just part of Xavier’s overall plans. AiPT! : And now for some HOX and POX questions. Hiago Miranda‏ (@hiagovmiranda) had a question about the House of X cover. Should we expect these five characters to be the focus of House of X? Or are there big roles to be played by other X-Men? Jordan: I don’t think that cover really tells you what to expect at all. You’re going to have to read the book to really know. AiPT! : Hypercortisone D‏ (@hypercortisone) noticed prominent roles sprouting for many of the New Mutants characters in the modern X-era and wondered if the Generation X alumni (outside of Jubilee) will play into the House of X/Powers of X era? Jordan: Seems possible. Chamber is in Uncanny right now. AiPT! : MagnetoRocks‏ (@MagnetoRocks) asked if the decision to put Magneto back in his Marvel Now-era costume was something Hickman specifically wanted–and most importantly, are his arms still bare? Jordan: Jonathan requested the white costume but if you look closely, it’s a modified version of the Bachalo costume. As for his arms… that remains to be seen. AiPT! : Peter LaVenia (@votelavenia) asked if you’ve ever thought about doing a series focusing on the quieter side of X-Men life? Jordan: Sure. But generally speaking, that sort of series does not do well. The X-Men are superhero comics at their core, and across the Marvel superhero line, comics about the superheroes not superheroing have not historically done great. AiPT! : Hickman recently shared his favorite X-Men characters, so this seemed like the perfect time to ask Comicbook Addict’s (@casterlylion11) question: Who are Jordan White’s top five X-Men? AiPT! : And speaking of Hickman, I was curious… How has it been working with him so far, and what makes collaborating with him different from other writers you’ve worked with in the past? Jordan: He’s smarter and a better writer and more morally upstanding. Seriously, it’s no secret he’s an amazing planner, and that is definitely a big part of working with him on this. AiPT! : Finally, for this week’s song recommendation–what song best describes the experience of working with Hickman? AiPT! : Thanks, Jordan–and I’m sure I speak for X-Fandom when I say feel better! Because despite feeling under the weather, Jordan still had time to share this previously unrevealed cover to X-Force #10! 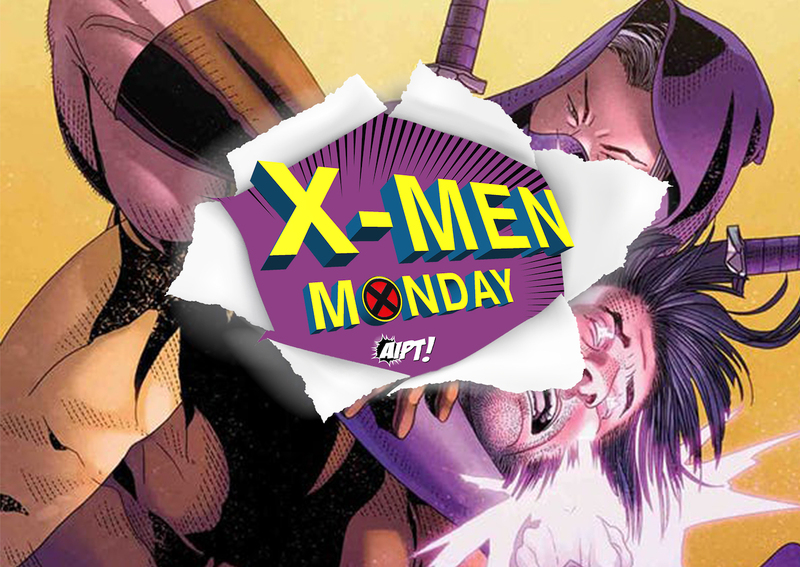 And with that we bring to a close another eXciting edition of X-Men Monday at AiPT! As always, I’d like to thank Jordan for taking the time to field X-Fans’ questions. And, of course, thank you to all the passionate readers who dreamed up those questions! Get your next batch ready for when AiPT! posts the call for questions on Twitter tomorrow (April 16) and report back next Monday to see if Jordan answers your questions! Oh, and take care of yourselves! Even if the weather’s improving, you can still catch a cold! ‘Gideon Falls Vol. 2: Original Sins’ review: Sophomore slump?